There are many ways to being irritating to other folks around you, although you might think of yourself as being fun-loving instead. It is all a matter of perspective, don’t you think so? 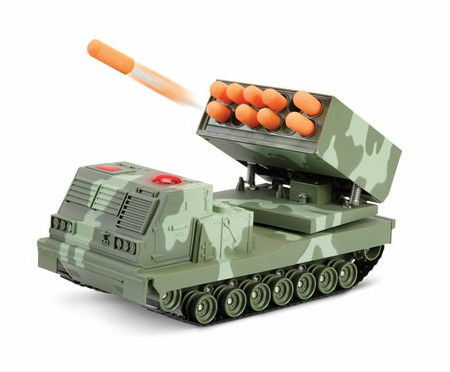 Well, assuming you would like to re-enact a modern day wartime scenario (the cutscene from Dune 2 certainly comes into mind about the insidious Ordos with their missile launchers), here is the $99.95 RC Rapid Fire Rocket Launcher that will be able to let you send physical projectiles to your targets who are across the room. Sporting a rather impressive 10-missile fusillades that are fired from a movable turret, it does not matter whether you are bombarding enemy forts into submission or stopping toy soldier offensives cold, or simply trying to gain the attention of the new cute secretary who just joined the company. This particular launcher is able to fire its 4″-long foam missiles as individual spotting rounds to zero-in a target that is located up to 15′ away. Apart from that, you can also choose to release a flurry of ordnance at once, where the built-in speaker would deliver additional punch by playing back realistic launch sounds.